Researchers at Rice University have engineered E. Coli bacteria to synthesise bio-butanol using a clever reversal of the natural beta oxidation cycle for fatty acids. 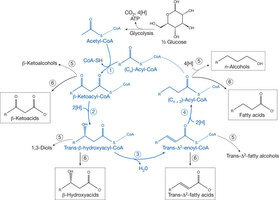 By running oxidation enzymes in the reverse direction, the researchers achieved a far more rapid synthesis than was achievable from the normal fatty acid synthesis pathway. ...Just how fast are Rice's single-celled chemical factories? On a cell-per-cell basis, the bacteria produced the butanol, a biofuel that can be substituted for gasoline in most engines, about 10 times faster than any previously reported organism. In other bioenergy news, the US DOE has released an updated Billion Ton report on biomass production for fuels. The updated report reaffirms the potential to replace up to 30% (or more) of the US petroleum consumption, using energy and fuels from biomass. The report also describes the best environmental approaches to biomass energy production, which could result in environmental benefits overall. Once a bioenergy infrastructure has been built, it will be possible for the machinery of bioenergy to run on its own produced energy and fuels. Microbes such as E. Coli tend to continue dividing as long as conditions allow them to do so. If you think of microbes as reproducing factories of high value products, you may begin to realise that as long as you feed them, provide the proper environment, and carry away their waste -- high value chemicals and fuels -- these little factories will keep producing. Biomass itself will soon be the cheapest source for sugars, to feed the microbial factories. Other biomass will be used to produce chemicals and fuels via thermochemical methods. Some will be torrefied and mixed with coal, or gasified and the syngas burned with natural gas or by itself -- to produce combined heat and power. The bottom line is that no scientist, engineer, or agriculturalist has any idea how much biomass the Earth can produce, when given the chance. Micro and macro algae appear to be the highest yielding crops -- capable of growing on over 80% of the planet's surface. But high yielding terrestrial biomass crops are being cooked up every day, along with the means of turning the biomass into sugars. And the microbes -- the microbes are getting a lot more sophisticated in terms of synthesis speed and yields. As long as we understand that all of these converging efforts are in the pipeline, and should not be expected to replace petroleum right away, things will come together in time. In the meantime we are floating in hydrocarbons. Time to get away from the dieoff.orgiasts and the carbon hysterics and set to work building a civilisation that feels at home in the larger universe.